The Free Burma Rangers, a frontline humanitarian organization, released a report detailing the recent use of jet fighters by the Burma Army against the Kachin Independent Army. FBR said that on “October 6 the Burma Army shelled Gidon Post more than 50 times with 120mm mortars. 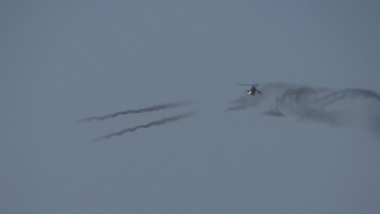 Some of the mortars emitted black smoke and some emitted white smoke. The FBR pointed out that the Burma Army also attempted to use helicopters in the conflict area until bad weather forced them to leave. The FBR said that the week leading up to the use of jet fighters against the KIA on the 4th October the “Burma Army 5th Brigade 1st Battalion fired on Gidon Bum Post 20 times with mortars. The fighting in Kachin State between government forces and the KIA has displaced tens of thousands of people and comes as Aung San Suu Kyi’s NLD government is trying to kick start peace talks with ethnic armed groups.